Bimetallic nanoparticles are highly relevant for applications in, e.g., catalysis, sensing, and energy harvesting. Their properties are determined by their shape, size, and, most notably, their chemical configuration, i.e., the elemental distribution throughout the particle. To fully exploit their potential a comprehensive understanding of the coupling between size, shape, and chemical ordering is crucial. 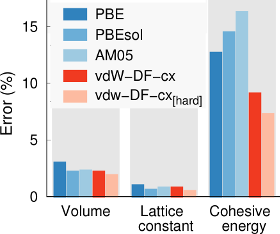 Here, we employ hybrid molecular dynamics—Monte Carlo simulations to reveal the energetics of two prototypical nanoalloys, Ag–Cu and Au–Pd, by comprehensive sampling across the full composition range, while considering both size and shape as parameters. 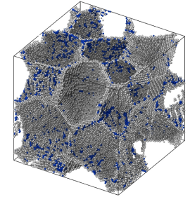 Our simulations expose the interplay between bulk thermodynamics, surface energetics and strain. 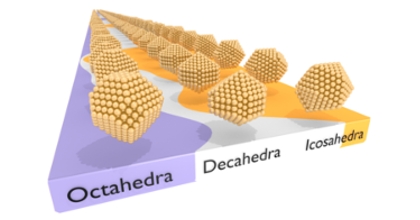 Relative to the bulk, the behavior of Au–Pd nanoalloys is dominated by surface segregation, and is thus largely independent of particle size and shape. By contrast, strain plays a key role in the Ag–Cu system, whence size and, even more so, shape have a strong impact on the overall energetics and accordingly the elemental distribution. 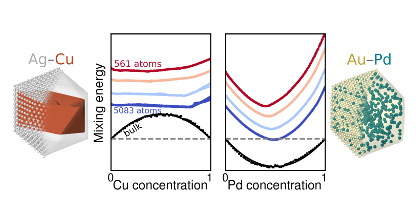 This effect is reflected by the sign of the mixing energy curve, which in the case of the Ag–Cu system changes from positive to negative when going from the bulk to the nanoscale. While this suggests miscibility it is rather a manifestation of segregation to different sites.